iTunes: Search “Kyle West” in iTunes and it will show up. 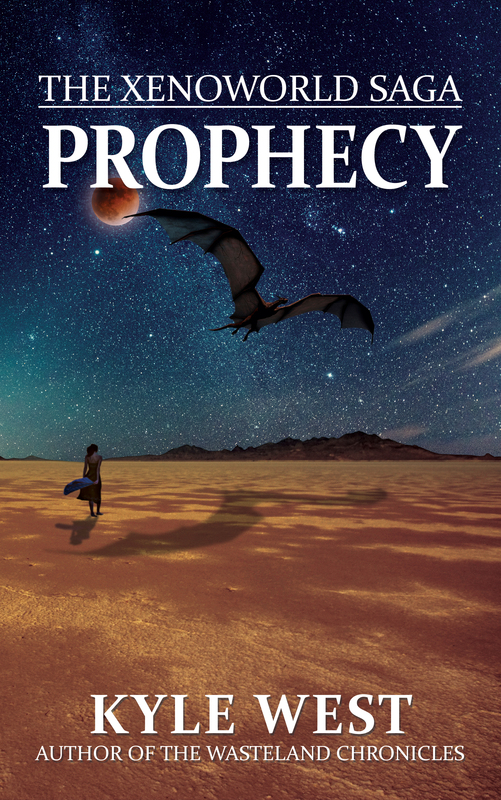 Prophecy is Live on Amazon! Well, the real show is here. First book of The Xenoworld Saga is out! Other retailers will be coming soon! They are still processing the files. Kindle Version of Wastland Omnibus Live! Wasteland Omnibus should be going live on all retailers very soon! It’s finally here, folks. I’ve submitted all the files to Amazon, Barnes, Apple, Kobo, and GooglePlay. It won’t be long until Wasteland Omnibus will be hitting your e-readers! For a limited time, the Omnibus will be on sale for a mere 99 cents – perfect for fans who want to reread the new version of Apocalypse on the cheap or gift the whole bundle to a friend! I’ll update this blog as soon as I’m aware of it being alive on any of these sites! While I’m waiting for the last round of proofing to come back (I should have the Omnibus back in a couple of days, and Prophecy a week or so after that), I’ve gotten started on the second book. My hope is to have it out fairly quickly (at least, relative to the length of time between Xenofall and Prophecy. I’m a little over 15,000 words into the new book, most likely to be entitled Bastion. I have material planned out so far for this book, and I have a rough idea of what the third book will encompass. Of course, I’m ready for both the Omnibus and Prophecy to be out, and they will be as soon as I possibly can. It’s all contingent on getting it back from my final proofer (which as I said, should be a couple of days). After that, it’s a simple matter of formatting and making it available for purchase. Prophecy will take a little longer, since my proofer hasn’t started on it yet. This, again, is just a reassurance that the wheels are turning and it won’t be long before both books come out. And if all goes well, the follow-up book to Prophecy will be coming out not too long after. No one’s more anxious to get these books out than I am, and going so long between releases is something I’m not used to. I definitely like how things used to be, and now that the series is starting to gel in my head, it most likely won’t be as long a wait between releases. Ideally, it will be at my former pace. Thanks again for patience! I’m lucky to have such supportive readers. From what my beta readers have told me, you guys should very much enjoy this new series. Expect Omnibus to be out in 1-2 weeks…Prophecy, probably 3 weeks. I’m at a point where I’m just waiting for other people to read through what I’ve already written, finding mistakes and such. As the title says this should take about 1-2 weeks for the Omnibus, and probably 2-3 weeks for Prophecy. We’re hitting the final stretch. I’m just ready for them to be out and I have some exciting things planned in and around release day. All your patience is about to pay off! In the meantime, I’m doing formatting stuff for the final e-book and paperback documents, as well as outlining Book 2 (which I’m considering titling Bastion.) All in all, fun stuff. The wheels are in motion, it’s just these wheels are turning a little more slowly than I’d like. We’ll get there, though. At least I’m confident enough to say that these books will be dropping in a few weeks’ time.